We get by with a little help from our friends! 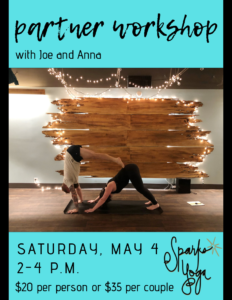 Join us for a partner yoga workshop with Anna & Joe on May 4. This interactive class will break down partner assists that will help you deepen your practice and have some fun. Come alone or bring a friend. This is a beginners friendly workshop. All levels welcome! $20 individual or $35 per couple.